The new Highline range of premium quality mowers from AL-KO offers innovative new technologies combined with high standards of engineering and user-friendly features, creating a lawn mower with high performance which is easy to use. Highline mowers feature a new patented steel plate cutter deck with and extra wide discharge chute and AL-KO’s unique MaxAirflow technology. This new design deck gives improved airflow giving better filling of the grass bag without leaving clumps of grass on the ground or blocking the discharge chute, even when mowing thick and tall grass. The 70 litre capacity ‘EasyClick’ grass collector indicates when it needs to be emptied and can be re-fitted to the mower quickly and easily. This mower has a 4 in 1 function, allowing it to cut and collect, cut and rear discharge, cut and mulch and cut and side discharge. Large diameter, wide tread wheels allow Highline mowers to be used on all types of grass surfaces. 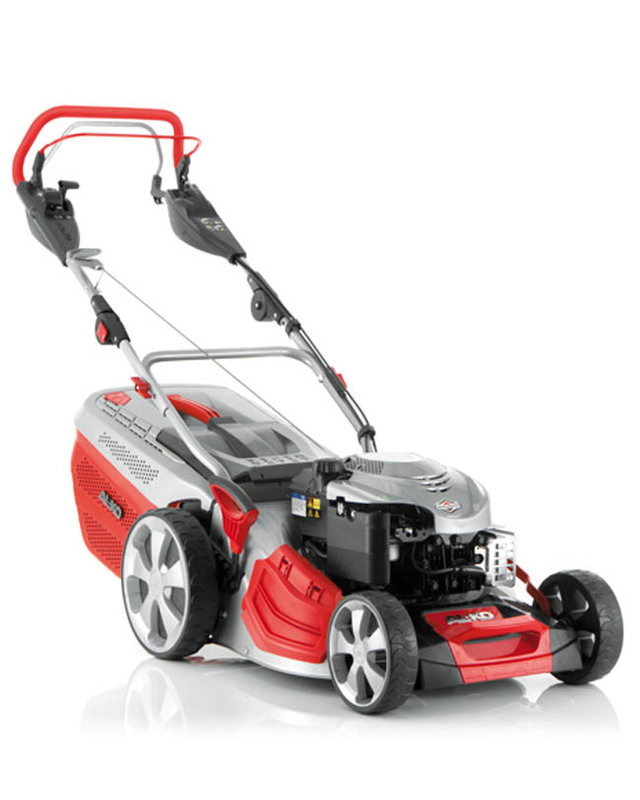 This an ideal mower to maintain gardens that have varied types of grass areas. With long grass areas such as orchards or paddocks where collection of cuttings is not required, you can side discharge the grass, leaving an even spread or simply allow clippings to discharge from the rear of the mower. For shorter grass, you have the options of either traditional collection or the increasingly popular method of mulching. Mulching cuts the grass into very fine clippings which are then returned back into the turf giving an natural fertiliser boost, leaving the lawn green and healthy. The other benefit of mulching is that it eliminates the need for emptying the grass collector, this can save up to one third of mowing time. Single point height adjustment gives cutting heights from 30mm to 80mm, most useful where one mower is expected maintain very different areas. The AL-KO 473 VS is powered by a powerful 190cc Briggs and Stratton 650E Ready Start engine. Cutting width is 18”/46cm. This mower is self-propelled and is fitted with VarioSpeed drive which allows cutting speed to be varied from 2.5km/h to 4.5km/h to suit grass conditions. Operator comfort and convenience is ensured by the ergonomic control layout, all drive, forward speed and engine controls are easy to operate and are grouped on the strong, folding handles. With the handles folded, the AL-KO 473 VS can be stored in a space saving position. * Delivery of the AL-KO 473 VS is included only to addresses in Norfolk and the Waveney Valley area of Suffolk. One of our own sales engineers will deliver and install this machine. We provide full aftersales support to all AL-KO products we sell from our branches at Horstead, Norwich and Toftwood, Dereham.